What's better than a Broadway show? TWO Broadway shows! There is this fantastic loophole in the Broadway system called the "lottery." If you don't have anything to do on a given night, you can show up a few hours before the show and put your name into a drawing. Selection of your name equals two tickets on the very (and I mean very) front row for twenty-five dollars apiece. It was actually Jenni's name that was selcted, so I'm glad that we are friends. We got to see Hairspray, which is about as far from Les Mis as they come. Set in the sixties with a lot of bop-shoo-bop and very big hair (that was actually kind of a theme). It wasn't stirring, but it was so, so fun. The actors were distracted by the overly tall girl in the front row with the dopey smile on her face. I could see sweat run down their cheeks and I almost got beaned by a hot dog cart. Awesome. 1. Got up at five and into the City by seven to get SNL tickets. The show wasn't taping today. Blast. Jenni and the NBC security guards and I had a good chuckle over that one. Father: "Daniel, I know that you are only a child of two and a half at the most, but can you spell 'quench'?" Daniel: "Father, as you know I am wearying of your paternal prodding and would perfer to play with my Thomas the train. But rather than resist, I choose to grow bitter and resentful over the many years of my youth and explode in a fury of rebellion when I drop out of Harvard to grow weed. Q-U-E-N-C-H."
3. Walk through Central Park. Jenni took a nap in the sunshine and I watched a very sweet father/daughter scene. 6. 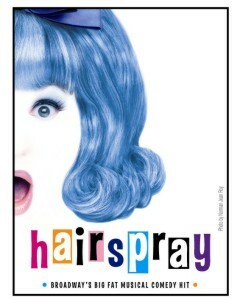 Hairspray on the cheap! I was torn between making this post a record of my Saturday happenings or writing something a bit more introspective. As you have probably guessed, I went with the first choice. I also know that I've only been talking about the good things I've seen and have said nothing of the sad/scary/disappointing experiences I've had. I just don't know how much post is too much post (although I sense I'm pushing the envelope). So all that to say, I have more to tell you and hope to disseminate the information when I get home and am no longer doing anything interesting. This post will be short because it is late, but I just wanted to record my thoughts while they were still fresh (and they're fresh, let me tell you. Don't let any children read this blog). My NYC friend (let's just call her Jenni) and I went to brunch in Chelsea and walked through art galleries in the Meatpacking District (which is known for its art, its nightlife, and its refrigerated hanging carcasses), spent a teeny amount of time in the Met (saw van Gogh, Monet, Degas, and Picasso), went to dinner at one of the best Italian restaurants I've patronized (called Pomodoro) and capped the evening off by attending a little play. What do you think about Broadway? I'm for it. Les Mis was at the Broadhurst Theatre (a legendary theatre I know nothing about), which was actually quite small. Way smaller than the Atwood Theatre at home. Unlike the Atwood performances, all seats are good and all the notes were on key. Refreshing. Jean Valjean was played by a swarthy character of medium height with an unbelievable range. Javert was black, elegant, and cold. Perfect. The story makes me sad, but the performance made me happy. Jenni said it best, "I have to admit, it was much more than I expected." You know, Some folks like to get away, take a holiday from the neighborhood. They'll hop a flight to Miami Beach or to Hollywood. But I'm taking a Greyhound on the Hudson River Line. Because I'm in a New York state of mind. Although, technically, I'm in New Jersey. My roommate loves the journey, too. This is Mel. 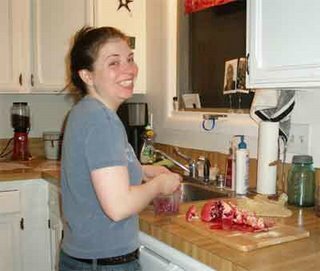 The instigator of the pomegranate revival. Tonight, in a fit of inspiration and snacky-stomach, I elected to revist an old love. 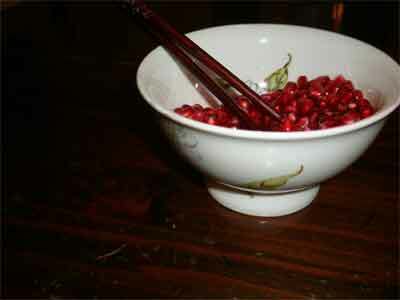 Not since the second grade have I dared delve for the sweet and sour juiciness that is contained within a pomegranate. So because my roommate bought them (they were two for one) and because I'm just that sort of adventurer, I decided to have a pomegranate for a midnight snack. I have to ask myself, are pomegranates worth it?? I'm not so sure anymore. 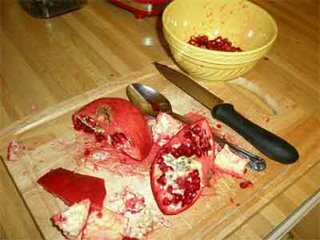 And I'm beginning to doubt the sanity of a mother who would send their second-grader to school with half a pomegranate and a spoon. It's a veritable blood bath. I think it comes down to loving the journey. If I tell you this, will you still be my friend? I have a confession to make. I really like Star Trek. 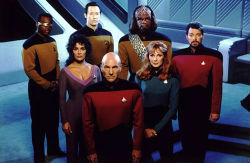 When I was in junior high, the crazy crew of the USS Enterprise were in their heyday. It aired like four times a day and I was right there with them - permed hair, knobby knees and all. When I watch old episodes (yes, I watch old episodes), I'll get an occasional dumb chill when I see the metalic purple bedclothes or the cheesy planet sets. And still I love it. I can't explain it any better than that. Okay, so on to my point! Do you have 11.25 hours to kill? Well if you do, and if you like Star Trek (it's okay! This is a safe space), then I've got a series for you. Back in college when I was spending my limited TV budget on jewels like Joe Millionaire and Extreme Makeover, there was a little TV show that slipped under the radar. It only aired 11 episodes and then it was cancelled, strangled by the shallowness of insipid American culture. The show, Firefly, is the answer to every person who has said, "Man, I wish there was a show about funny and flawed cowboys traveling through space in a craft shaped like a bug to a sweet Asian/Country Western soundtrack." Firefly. Check it out. It has lasers and horses and a guy named Jayne. You can't go wrong.